6/17 Cup of Coffee: It was a tough night on the farm, highlighted with a pair of walk-off losses. 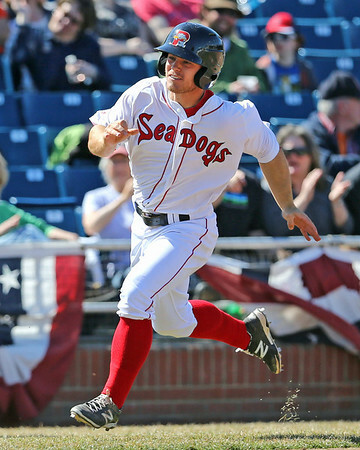 Led by Sean Coyle (pictured), Blake Swihart, and Deven Marrero, Portland came back from a seven-run deficit only to fall in the bottom of the ninth. Lowell fell in the ninth as well on a bases loaded walk. Allen Webster ended up on the losing end of a pitcher's duel for Pawtucket, while a trio of arms fired a shutout for the DSL Red Sox. The Pawtucket bats went silent in a 6-1 loss to the Rochester Red Wings (MIN). The three-game series at Frontier Field got started with a strong pitching matchup as Twins prospect Trevor May got the better of Allen Webster. Webster allowed two runs on seven hits in six innings, striking out five and walking one. Webster has allowed three or fewer runs in 14 of his 15 starts this season, but has only a 3-4 record to show for it. The Red Wings opened up the contest against the PawSox bullpen, as Alex Wilson surrendered three runs in the eighth and Jeremy Kehrt allowed another in the ninth. The PawSox offense managed only three hits. Two came off the bat of Mookie Betts, who doubled in the fourth inning and tripled in the sixth. Betts then scored the only run of the night when he walked and was driven in on a Garin Cecchini base hit. A valiant comeback effort by Portland went for naught as the Sea Dogs lost a walk-off, 8-7 to the Erie SeaWolves (DET). Down 7-0 early, Portland pounded out five runs in the fifth and two more in the seventh. The rally was keyed by back-to-back home runs by Blake Swihart and Sean Coyle. Coyle's blast was his second in as many games, as the second baseman was 2 for 4 with an intentional walk. Jonathan Roof hit a solo homer to lead off the seventh, his first since moving up to Double-A at the beginning of June. Deven Marrero played a major role, scoring on Swihart's homer in the fifth, and coming home with the game-tying run in the seventh. Marrero had three hits, including a triple, and drove in a run. Keith Couch struggled as the starter, allowing the seven runs on 10 hits in 3 1/3. He was bailed out of the decision by the offensive explosion and by the excellent work of Mike McCarthy. McCarthy kept the SeaWolves in check with 3 2/3 scoreless innings, giving up just one hit and striking out two without issuing a walk. After tossing a scoreless eighth inning, Robby Scott surrendered a walk-off home run to the leadoff hitter in the ninth. It was the first home run Scott has allowed this season, and the first earned run he had given up since April 30. Lowell also was on the wrong end of a walk-off, falling 4-3 to the Tri-City Valley Cats (HOU). Randy Perez was solid in his New York-Penn League debut. The left-hander allowed a run on three hits in five innings, striking out three and walking two. He was supported by a balanced Spinners attack. Every member of the Lowell offense reached base, and its nine hits came from eight different batters. Nick Longhi was 1 for 4 with a double and an RBI, and his now 6 for 16 through four games. Raymel Flores was 2 for 4, and also had a run batted in. Flores has hit safely in each game. Tri-City benefited from some wildness from Ellis Jimenez. Jimenez came in for the seventh and walked two batters each inning, including one with the bases loaded in the bottom of the ninth. The affiliates' only win of the night came in the DSL, where the Red Sox shut out the DSL Giants, 5-0. A trio of arms combined on the gem, led by starter Ritzi Mendoza. Mendoza allowed only three hits in his five innings of work, and has yet to allow an earned run in 13 frames across three appearances. Jervis Torrealba followed with three scoreless frames, and Juan Perez finished it off with a hitless ninth. As usual, Rafael Devers was at the center of the offense for the Sox. The 17-year-old third baseman was 2 for 4 with a double, a walk, a run scored and an RBI. He has reached safely in all 14 games this season, with a .415/.522/.736 slash line. Luis Alexander Basabe was 2 for 4 with his fourth triple of the year. He was joined in the lineup by twin brother Luis Alejandro Basabe, who made his 2014 debut after missing two weeks with a hamstring injury. Luis Alejandro was 2 for 3 with a run scored. Yoan Aybar, one of the youngest players in professional baseball, was 1 for 3 with a double, and has hit safely in all six games that he has appeared. Player of the Day: Sean Coyle homered for the second consecutive day, and is in the midst of a hot streak. He is riding an eight-game hitting streak, going 10 for 29 in that stretch. Overall, the second baseman has a .353/.408/.568 line in 2014.